In response to the state of the semiconductor market after the end of the super-cycle last year, South Korean chipmakers are refusing to restart the “game of chicken” of the 1990s, instead opting to prepare for another big leap, according to industry officials Wednesday. Concerns have been raised by some market watchers ahead of the completion of two NAND flash chip plants by Samsung Electronics this year that such aggressive preparation by the world’s biggest memory provider could further aggravate the current oversupply problem and even invite another industrywide “game of chicken” in the global semiconductors market. The game of chicken refers to the price war among around 20 memory chip companies in the 1990s to reduce their inventories by selling stock at progressively lower prices. The competition was so fierce that only three chipmakers -- Samsung, SK hynix and US-based Micron -- remained in business after 2010. Due to the accumulation of memory chip inventories at Samsung Electronics and SK hynix since the fourth quarter of last year, industry watchers have said the two biggest memory providers might try to sell their stock at lower prices than before, aggravating the oversupply problem. But the companies say it is almost inconceivable that the global semiconductor industry would begin another round of chicken and that they are ready to employ timing strategies to tackle the issues of oversupply and falling prices. 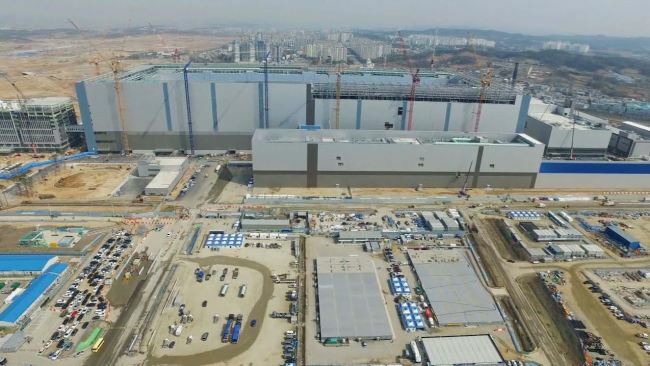 There are rumors that Samsung has moved the timelines for its new plants in Xian, China, and Pyeongtaek, Gyeonggi Province, forward to the end of this year. The rumors circulated after Samsung heir Lee Jae-yong visited Xian earlier this month to check on the progress of construction at the China factory, but a Samsung official denied this was the case. Both Samsung and SK hynix announced through their earnings calls last month that the companies would put off any moves to ramp up production or equipment investment for their new fabrication plants this year. “The new NAND flash fabs are being prepared for likely growth in demand after the second half of this year, when the fifth-generation network era really begins and demand for larger-storage SSDs (solid-state drives), PCs and mobile devices picks up again,” an official at SK hynix said.